Diary of a Miner: Back into Hell! The amount of stuff we were all carrying between us made out that we were going to be staying in the Nether for some time. Who knows, we actually might be there longer than before. 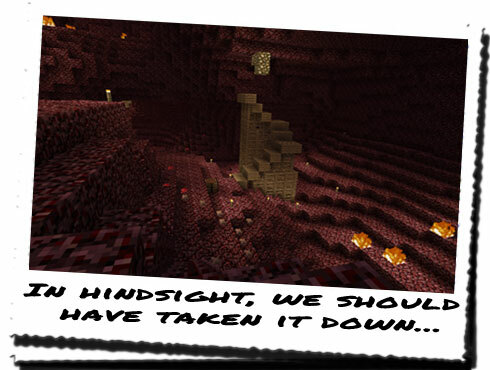 The purpose of heading into the Nether is to determine how much HoN Co. knows about our previous operation into the Nether, and whether they found our base camp. It's already been established that they know of and have probably ceased the wooden rigging we had used to reach the glowing stone, so we're going to have to be careful about what we do once there. We can't draw any more attention to ourselves than we already have. After everyone was ready, we all headed off to the lab, and through the secret passage to the right which led directly to our private portal. The long passage was brightly lit, probably more so than the rest of the base, and it took a bit of adjusting to. 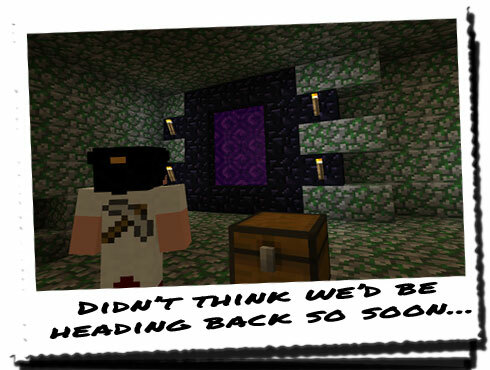 Soon we'd have to readjust again to compensate for the lack of light in the Nether. "Once we're there, we need to establish how much of our presence has been compromised. If it's less than we think, it would be a good idea to try and find traces of HoN Co.'s presence as well. UOPETA said that they have put up signs so they can't be that hard to spot." Reaching the midway checkpoint, COLUS flicked the switch, opening the door and allowing us to pass through. After reaching the end, we were presented with a large, mossy cobblestone wall, with a lever on the wall to one side. Flicking that one as well, we all waited for the harsh grating sound to stop before heading in to the portal chamber. It was still active, the original entranceway was still blocked and there wasn't a sign of life anywhere. We had the option to lock the cobblestone door behind us from the outside with a dual lever lock, but we would need UOPETA to make his way up to us if SERVERE finds anything else. He will have to lock everything behind him as it's unlikely that any of us would be returning after that. Putting all the bags and cases down, we each sized up the portal as though it were some sort of beast we had been forced to fight. "Right, THEROS and Syeonyx will head in first. Check the base camp and see if anything has been moved or taken. Check a small area surrounding the camp and see if you can spot any HoN Co. activity. Come back after a minute or so and inform us of the situation." Leaving the bags behind, I followed THEROS to the frame of the portal, ready to step through, but Amie stopped me. Spinning me around, she hugged me tightly, as though she was never going to see me again. I reassured her that I wouldn't take too long, and that I'd be back before she knew it! That would literally be the case though for her anyway, as the timeshift between the two dimensions would work to her favour. "That's true. The time experienced in Minecraftia is more or less tripled when in the Nether. One minute in the Nether is twenty seconds here... They will literally be back before you know it." Amie seemed a little more comforted by OROTHO's reassuring words, and I followed THEROS through the portal. As I passed through the rift into the Nether, I felt nauseous and had to close my eyes until I had fully passed through. THEROS was standing there waiting for me with an odd look on his face. "You took your time... Come on, we can only be a minute or so. I thought I heard strange sounds from up ahead, so we're definitely going to have to make this quick." I followed THEROS up the strange stairs that broke off to the right, until we reached the top. Despite the lack of any torches at all, there were numerous fires around that seemed to burn indefinitely, which provided plenty of light to see by. The walls and floor were made up of a strange fleshy rock, that appeared putrid and squishy, but was solid to walk upon. This place had creeped me out from the first time I ever came here, and now was no different. Heading off to the left, I continued following THEROS who seemed to be taking over the role of UOPETA, in his absence. He was doing a good job of it as well; he didn't continue around corners until he was sure it was clear ahead, and he continued like this until we reached the base camp. It seemed odd to see it again, and looking around it seemed as though it hadn't changed at all. That was good news because it meant HoN Co. hadn't found it yet. Once we were sure that there wasn't anyone close by that could pose a risk to our safety, we headed back down the stairs and back through the portal. "No it wasn't... We were in there for about five minutes..."
"It doesn't matter, has HoN Co. found the base camp? Is it safe to head on through?" "There's no sign of anything being disturbed at the camp, and there are no posts or other signs of HoN Co. being anywhere near our camp either." "Excellent! Let's head through then!" I picked up my bag before helping THEROS with the chest that we had left behind, before following everyone through the portal. Amie went before me this time, with THEROS being the last to go through this time. After shaking the nausea from my head, I followed Amie back up the stairs for the second time, back up to the camp. Once there, we set everything down and were immediately given a new task by COLUS. "We need to know how close HoN Co. have come to finding this base camp. Go out and look for the platform we constructed and see if there's anything there which suggests they've found it." Leading the way once more, I followed THEROS out from the main gates of the base camp and down to the right. Unlike before, we couldn't see any strange creatures; pig-men, floating ghost creatures or Creepers... At least we wouldn't be presented with immediate dangers or distractions. Heading down the crude steps, we followed the trail of torches that we had left behind us which presumably still led away to the site where we had found the glowing stone. Up ahead a series of fires continued to burn, casting odd shadows everywhere, but there was still a distinct lack of any local fauna. That didn't bode well at all. If something had spooked the surprisingly curious creatures we had encountered before, it meant that we were likely to experience trouble soon enough. Reaching the top of the hill we had been steadily climbing, we looked down into the small valley below and immediately spotted the rigging and platform that we had left behind after excavating the glowing stone. "Yeah, a little suspicious, I'll admit that... Maybe we should have done something about it before we left... The thing that confuses me is how they found this, but not the camp. I mean there is a trail of torches leading straight from one to the other..."
It didn't matter, but we just had to ensure they never did find us. We'd have to remove them on the way back to the camp, but I got the feeling that THEROS wanted to explore a little further.